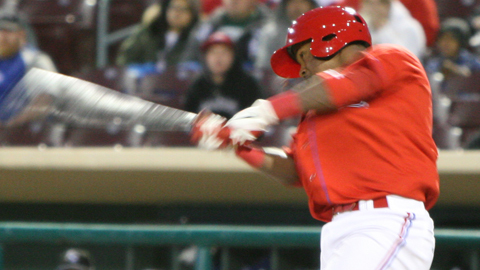 Inland Empire shortstop Jean Segura is off to a great start in 2011, hitting .348 in 16 games and showing off exceptional tools in the field as the next great Angels infield prospect. Segura is no secret, however. The young shortstop has hit well since making his pro debut with the Angels' Dominican Summer League team in 2007. Segura put himself on the prospect map when he hit 10 homers and 24 doubles with 79 RBIs with Class A Cedar Rapids last year. He's the 66ers' leadoff hitter this season and has delivered in the clutch with a .485 average with runners on base so far. Segura hails from San Juan de la Maguana in the Dominican Republic, a city of just over 100,000 people located in the western part of the country, about 30 miles from the Haitian border. Not many ballplayers come from Segura's city, but he and his baseball brethren reach out to their hometown citizens. Segura advises aspiring players against drinking and using drugs. "I have five years in pro baseball," Segura said. "I know how it works and how difficult it is playing here." Segura thrives thanks to his organization's teachings in baseball fundamentals. He says his teams play hard and the players learn what they need to do to win, like laying down the perfect bunt. "If you don't know the fundamentals, you don't play in the big leagues," he said. The Angels also take good care of their own. Segura collided with Oakland first baseman Andy LaRoche while running out a grounder in a Spring Training game in February. The collision was so violent that he broke his batting helmet in half and was removed from the game as a precaution. "I thought I broke something in my face, but I didn't," he said, laughing. "When I stood up I felt really good, like I could keep playing the game." Segura has adapted to life in the United States as well as he has adapted to California League pitching. He's an ace at speaking English. "I learned English by talking to my friends," he said. "The only reason why I speak English well is because I've never been afraid to speak it." The transition hasn't always so easy for him, though. "It's difficult," he said. "Having your family [in the Dominican Republic] and living by yourself in the Untied States is hard." Segura mentioned food among the things that are different in America. He hasn't yet found good Dominican food here, but he has found Chipotle. "It's not too bad," he said, smiling. Ports making a splash: OF Kent Walton hit for the cycle with Stockton on April 21, achieving the feat after flying out in his first at-bat. Walton hit .317 in 41 at-bats and is tied for third on the team with nine RBIs as a part-time player. He was so good in the Cal League that he was promoted to Double-A Midland on April 24, where he went 2-for-3 with two runs scored in his first game with the RockHounds. On the mound, Daniel Straily won Pitcher of the Week after going 2-0 with 14 strikeouts in 13 innings. Red-hot hitter: Bakersfield OF Stephen Hunt wasted no time in his first four games of the 2011 season. He went 9-for-16 with three homers and 13 RBIs and scored six runs, including a five-RBI day against Inland Empire on April 21. His hot hitting earned him Player of the Week honors. Hunt was Cincinnati's 15th-round pick in the 2010 Draft out of South Florida, where he pitched and hit in three years at the school. He batted .338 in 77 at-bats for the AZL Reds before moving up to Billings in the rookie Pioneer League to close out the 2010 season. Top-flight closer: Lancaster RHP Kirk Clark notched his sixth save of the year April 25, tying him for the league lead with Rancho Cucamonga RHP Steven Ames. Clark allowed his first run of the season Monday, breaking up a streak of seven scoreless innings to start the year. The closer from Creighton is 4-for-4 in save opportunities since April 15 and has 10 strikeouts over eight innings. He led the South Atlantic League with 29 saves for Class A Lexington last season and had 55 strikeouts in 55 1/3 innings.